The Witch golf course is another remarkable Myrtle Beach golf club designed by Dan Maples. Maples created a thrilling layout on 500-acres of secluded land between Conway and Myrtle Beach, South Carolina. The course is free from the distractions. No backyards. No hotels. No commercial developments. The Witch was named for its beautiful surroundings and deceptive holes. While other Myrtle Beach golf courses offer risk and rewards, the Witch - rewards big. Golf Digest gives this exciting course an impressive 4.5 star ranking. Locals and tourists alike find the Witch to be a captivating favorite among other Myrtle Beach golf courses. This Myrtle Beach golf course consists of bridges, wetlands, undulations, and oyster beds. The Witch stretches over a wildlife preserve and creates a "mystical" golfing experience by showcasing sand bunkers, lakes, and contrasting elevations. Located on a natural terrain makes it not uncommon for golfers to encounter native inhabitants ranging from waterfowl to alligators. Watch each step and steer clear of the water. The water hazards are not just for balls but also gators! 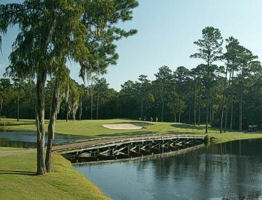 The Witch is cleverly designed and offers outstanding Myrtle Beach golf. Golf vacation packages are available and recommend. Saving you moolah! Golf packages often include last minute golf tee times and fabulous accommodations at Myrtle Beach resorts, Myrtle Beach condos, and Myrtle Beach oceanfront hotels. Visit Myrtle Beach! Your next golf vacation is only a few clicks away. Love the Witch. Love the wildlife, like the many alligators, birds and many little creatures that live there. The course is beautiful and challenging. The azaleas are beautiful, as well as the dogwoods. It's a wildlife preserve and isn't surrounded by houses. Just love it. Challenging but fair. This course has some great views, nice fairways and greens that are super fast. Be on your game when you come to the Witch. Great course, love the gators! Front 9 was in good shape. Back 9 needs some work. The course was in great shape, and we saw alligators, egrets, and lots of turkeys on a beautiful spring day! Highly recommended The Witch--no houses or condos, and you're playing a course that meanders through the woods. Alligators were spectators to the performance of the golfers. We had fun. Beautiful course with lots of wildlife. After yesterday's rains it was rather wet in spots. This course is my favourite. Very nice scenery, water, and woods. Challenging but not hard to play. The Staff was very helpful & Nice. Our group from Houston Texas with 17 guys really enjoyed the Golf course & the hospitality.Awesome day of golf. Course is in great shape. Thanks to the entire staff at The Witch. Played two times last week on an annual buddies trip. Course is fun with some challenging holes. Staff was very friendly and starter got us out ahead of schedule. I like that course doesn't have a bunch of homes surrounding it and the wildlife is pretty spectacular. Greens are in good shape, fairways are great, tee boxes need a little leveling in spots. Helps to get a yardage book at this course, there are some blind shots that unless you drive up to take a look you wouldn't know you would be hitting into trouble. The Witch golf course is another remarkable Myrtle Beach golf club designed by Dan Maples.